The most powerful panel at last year’s Children’s Literature Association conference was “Needs of Minority Scholars,” featuring Sarah Park Dahlen, Ebony Elizabeth Thomas, Laura M. Jiménez, and Marilisa Jiménez García. 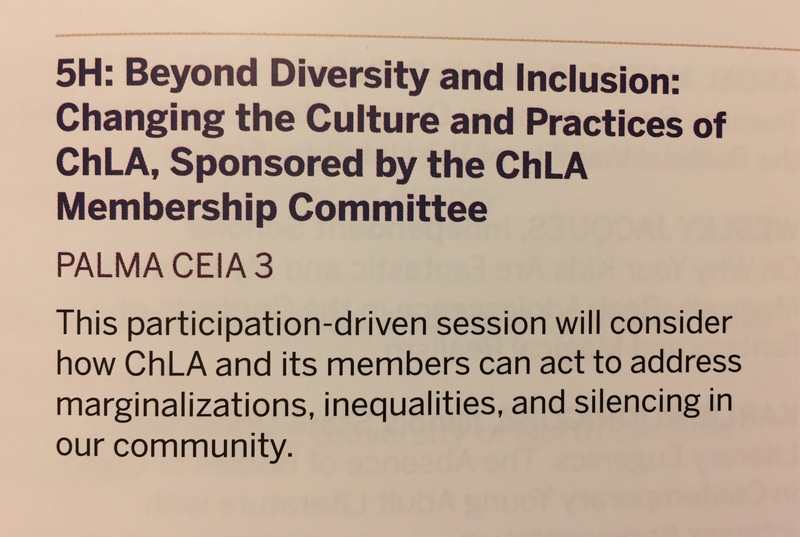 If you are at the Children’s Literature Association conference right now, I encourage you to attend the follow-up session, “Beyond Diversity and Inclusion: Changing the Culture and Practices of the ChLA.” It will be held tomorrow (Thursday, 22 June) at 3:30 pm in Palma Ceia 3. Hi, My areas are in Library and Information Science, Educational Technology, Social Studies Education. I am very interested in Childhood and Youth Studies, an area that looks like Social Studies with modifications for studying young people I have a BSE, MSE and MA. I have read and studied children’s and young adult literature for over 30 years. I am not allowed to get formal training in CYAL at the graduate level. I also have some disabilities which cause issues for my health and ability to function at the graduate level.